The Federal Premium Ammo Vital-Shok brand is a leader in the world of hunting, be it big game, medium game, or varmints. The defining features of all Federal Premium Vital-Shok ammunition is the highest quality Nickel-plated Boxer primed brass, the best performing bullet available for the prey being hunted, match grade primers, and top of the line powders. 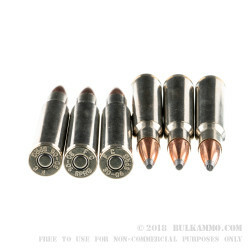 This Federal Premium Vital-Shok 30-06 ammo is topped with the famous Nosler Partition bullet. 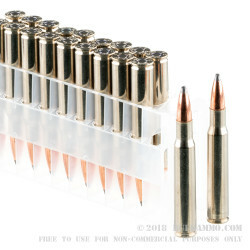 One of the faster rounds in the Federal Premium 30-06 line up, these travel at muzzle velocity of 2,700 feet per second, have a heavy hitting muzzle energy of 2913 foot pounds. This comes paired with a ballistic coefficient of .474. The Nosler Partition bullet is famous for its construction and performance. The top part of the Nosler Partition bullet is designed to expand and open up on impact causing mass trauma to the animal, and the bottom is designed to stay intact so the mass of the round continues forward penetrating to a lethal depth. The copper jacket is tapered so the tip is thinner and gets thicker toward the “partition” area of the bullet. The jackets’ thinner tip with thicker partition aids in the expansion and “blooming” effect described previously. 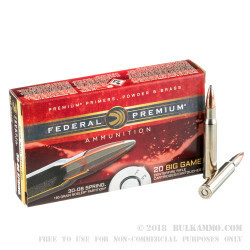 This 20 round box of 30-06 is the perfect size for your next Elk, Moose, or heavy game hunting trip. Get yours today!